Even though August is right around the corner, there is still plenty of summertime left, and I'll hold on to the season for as long as possible. We finally wrapped up painting our deck last week, and it's been fabulous getting to use it now, just enjoying the fruits of our labor. We eat most of our meals outside (one of my favorite perks of summer! ), and BBQ food is one of our main staples this time of year. 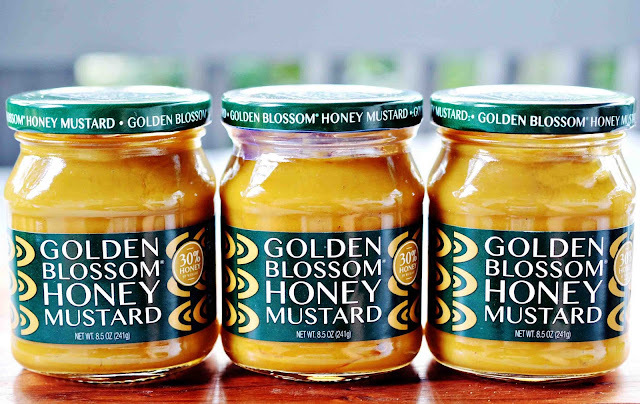 I usually stick with my grandma's baked bean recipe since it's a family favorite, but since I am really, really loving the new Golden Blossom Honey Mustard, I thought I would try switching it up with this Three Bean with Bacon Bake recipe recently. A little tangy, a little sweet, a little savory made for one surprisingly great twist on an old classic! What's your favorite perk of summer? Fresh peaches from the back yard sound heavenly! I am trying to convince Jason to buy me a fruit tree for one of the ugly patches in our back yard. I haven't decided if I want a granny smith apple tree or a plumb or cherry tree yet. I would love some mulberry bushes too. I won't be doing zucchini again next year though. Too much work for them to die on me! I researched on what I did wrong. You really have to baby those stupid zucchini plants. Water at the root level. If it rains, go wipe the leaves down. I'm not messing with all that lol. Jason is worried about the fruit trees because he thinks I won't pick all the fruit off and it will fall to the ground and make a mess, attracting unsavory critters in the process. My mom has a recipe that's similar to this. It's so good. I'll have to share this one with her. She always brings it to potlucks. Nom! This would be great at a potluck! 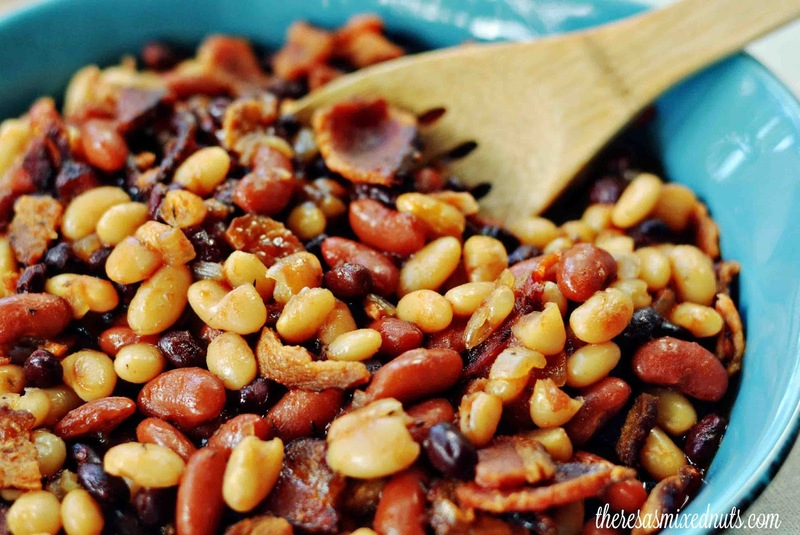 Baked beans are such a great potluck staple since they are so easy to prepare. I didn't know they made a honey mustard! I usually make my own, but this seems like the perfect short cut! That looks so good! Beans and bacon are a classic combo, and they're so yummy! My favorite perk of summer are evenings at the pool! This recipe looks great! What an awesome combo of flavors! Now, that is different. I can't say that I have ever seen a soup that looks like that. It sounds good though. I am typically not the biggest fan of baked beans, but these seem like a total exception! I really appreciate that they are both savory and sweet, yet not covered in sauce. YUM! This baked beans look so good! I love the tangy, sweet and savory flavors going on in there! 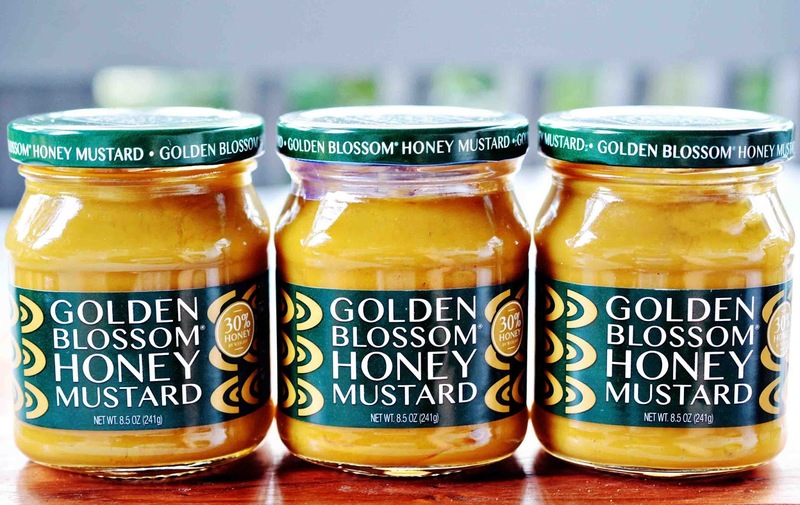 Golden Blossom has honey mustard? Woot!! And oh yes, I would definitely love to try this recipe!! I'll try any... most things once and I'd definitely try this recipe. It looks delicious. That looks really yummy! I love a good bean bake. If it's one thing I love, it's beans especially with bacon. This looks heavenly right now! You know I never really thought to add those things to beans but the combination sounds amazing!! BBQ is definitely one of the many delicious perks of Summer. I'm big into seasonal fruits; nothing like a nice watermelon or juicy peach on a hot day! Oh, this is a nice meal. My son loves beans and surely he will like this plus it is baked! This is a perfect side dish to any summer get together! Yumm! You had me at bacon! This sounds phenomenal! NOM. That looks delicious and would be great to take to a potluck. This looks amazingly delicious! YUMMY!! 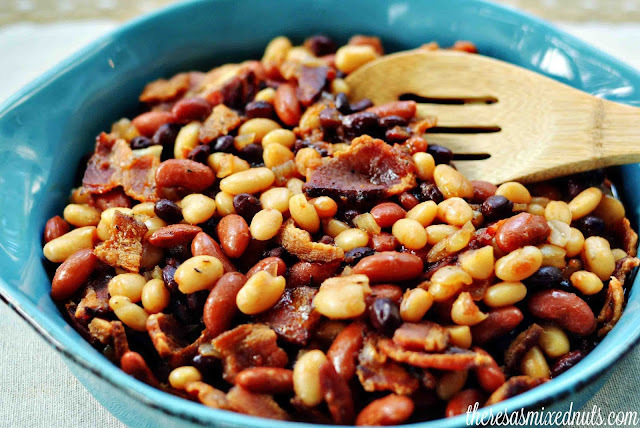 beans and honey sound perfect! WIll substitute the bacon with something else, Theresa..but it certainly looks yuuum..
You know your beans, all right! It looks great.